Two irrigation projects in South Canterbury and Central Otago have been awarded a total of NZ$1.1 million in government funding. Crown Irrigation Investments Ltd has agreed development grant funding of $339,875 for the Orari-Temuka-Opihi-Pareora (OTOP) irrigation conceptual design and costing project, which Environment Canterbury (ECAN) is managing. 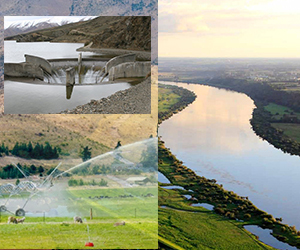 The project will build on the wide range research carried out in the broader South Canterbury region over recent years, and look at the potential viability of the scheme in terms of water availability, infrastructure options and commercial feasibility. Crown Irrigation Investments also announced $815,000 funding into the Manuherikia Water Project in Central Otago, which will allow a Falls Dam proposal to move forward. This will enable six independent irrigation companies in the Manuherikia valley to amalgamate under a single legal entity, WaterCo Limited, with a view to expanding the current area of farmland and orchards under irrigation. Environmental Non-Governmental Organisation Forest & Bird is seeking assurances that no public money would be spent investigating related proposals that involve flooding the Oteake Conservation Park. Three options have been investigated: raising the existing Falls Dam by about 6m, or building a new dam, which would be either 12m-15m or 20m higher than the existing dam, but a new proposal was also possible. Forest & Bird warns that even the low dam proposal, raising the level by about 6m, would probably flood the breeding habitat of threatened black-billed gulls and possibly the breeding area of the nationally endangered black-fronted tern.